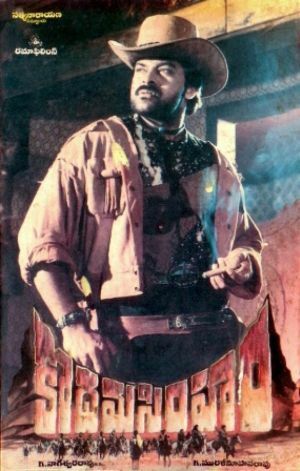 Chiru as a cowboy! Hidden treasure! Radha as a jungle warrior princess! While I love a lot about Kodama Simham I am going to begin with a caveat. There are some horse stunts that turned my stomach. If that would worry you, have the fast forward button at the ready. In a couple of scenes it did look like the horse that went down got up and ran past the camera so maybe I am overestimating the likely damage. But it is something that makes me wary of this genre, no matter what industry made the film. And it seems a bit rough when it is a horse that saves the hero at a critical point. Bharath (Chiru) is a gunslinger – the good kind – picking up the bounty on criminal types. Bharath manages to upset the local purveyors of iniquity. His parents are killed, but not before his dad tells Bharath he was adopted and to go look for his biological parents. His father Dharmadev (Satyanarayana Kaikala) hid some treasure to keep it safe, but was forced to go into hiding while Bharath’s Ma was jailed. Bharath must retrieve the treasure, clear his parent’s name, and give the bad guys their comeuppance. Simples! I’m not sure what time period this film is meant to be set in. There are few reliable fashion indicators. Horses are the only form of transport although there does seem to be a lit-up fish tank and a jukebox in the saloon. There are what look to be Native American styled natives, as well as a forest dwelling tribe of non-specific plumage. Plus the (possibly) cannibal cat-people guarding the hidden treasure. There are hangings and shootings galore, and justice seems to be an individual pursuit. Well, Brahmi is the local police so I can’t blame anyone for deciding to go DYI. Bharath disrupts an auction where young ladies are being sold to men or brothels, sets the captives free with a cheery “All the best” and that seemed to be the end of that. Swapna is chased for the umpteenth time by men of bad intent and runs into the jungle, leaving her girlfriends for dead. Nice. She meets Dharmadev who tells his boys off for their lack of manners and again, that seems to be the end of that. There is a pleasing finality to some of these issues: “You’ve been told, now bugger off and don’t do it again”. “OK”. If only that worked in real life. While the title cards said K Muralimohana Rao directed, at times I suspected the film was being ghost directed by the Hat Department. Telugu cowboy films always turn it on for the headgear, and this was a corker. Behold! Chiru’s hero entrance starts, as it should, with his boots before the rest of him swaggers in to view. Unfortunately it is hard to tell on a grainy VCD print, but in one scene if his boots aren’t bulletproof, they come close. He has a laconic style and an extensive collection of guns. But what makes him an unstoppable Hero is his self-belief and righteousness. There is a touch of Clint Eastwood in how Bharath is styled – he wears a poncho with panache (probably all that practice Chiru has twirling capes) but Chiranjeevi puts his own stamp on the role. Bharath is a dancer and a ladies man as well as a capable fighter and filial son. Directors must have count their lucky stars to get a hero who could dance and fling himself around in action scenes and do the horse riding scenes as well as being ladybait. The story builds up to an all-in confrontation, and Bharath does follow a fairly logical path to that conclusion, even if the steps along the way strain the elasticity of my disbelief suspenders. Could one heroine suffice for such an exemplary hero? No. Swapna (Sonam ) is the mayor’s daughter. She has a penchant for making bad art and wearing terrible outfits. Bijli (Radha) could probably be described as a tribal princess. She likes hunting, shooting and wearing bad outfits. There is some common ground for these ladies if only they could see it. It took me a while to place Sonam but then it hit me. The vacant stare, the pout, the head tilted on the side – She was in Ajooba! Maybe her career is worth investigating further…. Radha of course was an established heroine in South films at this time, and Bijli is the more substantial of the female roles. She looks like she had fun playing the kickarse leader and Bijli and Bharath were the main drivers of many of the revengey plans. Sadly for Bijli, Bharath seemed to be drawn to the girl who did enough stupid things that he would be kept fully occupied in saving her. Pran is the dastardly Mayor. He is first seen reading a proclamation off a fancy silk scroll before ordering the hanging of an assortment of extras. I was so pleased when I recognised him but somewhat disappointed that he was in such a stereotypical role with little scope for him to really work his villainy. Still, Pran! Always fun to see worlds collide even if he did try and have Chiru’s eyes out with a red hot poker. Mohanbabu is the pungent Suddigaali – everyone sniffs when he turns up and no one looks pleased with the result. He is a cartoonish villain but his spaced out reactions and bizarre logic made for some entertaining scenes. Sudhakar is the Mayor’s bumbling accomplice and does his usual shtick. Kannada Prabhakar is a more flamboyant and sociopathic bad guy. There is also that guy, who looks like a) Jaws from the Bond films and b) he stole one of Chiru’s costumes. There is a villain for all seasons in this film. This is one of the films where I wait eagerly for the songs. Every picturisation has its own kind of awesomeness, largely fabric based. Raj-Koti’s songs are fun and Chiranjeevi makes the most of the choreography. I choose to believe his dancing on the ceiling was a tribute to Fred Astaire rather than Lionel Richie. Sadly few of these songs are available on YouTube or the like due to the egregious copyright claim shenanigans. I cannot fathom why a company with no apparent interest in promoting or preserving the old films they allegedly own would object to short clips being shared online when they don’t have their own version uploaded. I’d get it if they were worried about loss of ad revenue, but often I am mystified. Unless they’re worried someone will try and buy a copy. See this, if you can find a copy, for the full tilt tongue-in-cheek mass style transplanted to Cowboy Country and the pleasing commitment to justice and hats. Chiru is in fine fettle and Radha is an excellent foil. The more is more approach means you’ll never have long to wait for the next song, dance, fight, demonstration of how to transport a treasure chest across a gorge or costume change. 4 stars! This entry was posted in Tollywood and tagged Adventures without subtitles, Brahmi!, Chiranjeevi, Chiru, K Murali Mohana Rao, Kaikala Satyanarayana, Kannada Prabhakar, Mohanbabu, Pran, Radha, Raj Koti, Sonam, Telugu, Tollywood. Bookmark the permalink.